This tour is not about cycling as many kilometers as possible each day. It’s about feeling the land, meeting the people, and enjoying the camaraderie and hospitality of the road. The trip also includes learning about the complex realities of today’s Middle East, especially the dynamic between Israel, Palestine and Jordan. There will also be visits to sites of historical, religious, and ecological importance, which will complement the cultural and political aspects. This tour does not require any prior experience in cycle touring. Any reasonably fit person in good health will be able to manage. Obviously if you train a little before the tour then you will be better equipped to enjoy the experience. Each morning and evening the group will stretch out together to help maintain good bodily fitness. You'll meet Green Olive CEO, Fred Schlomka , who favours adventurous cycle tours, often touring solo in exotic places. You can read about his recent adventures at this link. Fred will be accompanied by one or two Green Olive guides on the inaugural tour in March. This tour is semi-supported and adventurous, so expect the unexpected. Each cyclist will carry their own clothing, personal items, water, snacks on the bike. Some days we may be packing lunch also, and on others we'll stop in a village. A list of suggested items to bring can be found on the registration form, and will be emailed to you after registration. If you do not bring your own bike, helmet, or panniers, these will be provided. The entire tour will be on paved roads. The group as a whole will also carry extra tires, inner tubes, tools and other items for repair and maintenance on the road. These items will be provided by Green Olive for the rental bikes. If you bring your own bike then please bring your own maintenance supplies. In the event of an emergency, or the complete meltdown of a bike, a support vehicle can reach the group in 2-3 hours. Accommodations will be varied, from camping, dorm rooms, home hosting, to a 5-star resort. Let us know if you have any special needs or absolutely have to have a private room. We’ll do our best to oblige. 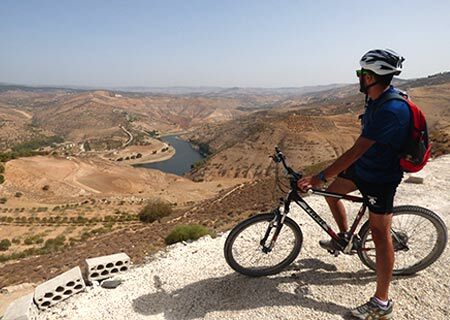 The group will assemble at a guest house (we'll let you know where) in Jerusalem by 5pm to met the group leaders, your travelling companions, and check the bikes. There will also be a briefing and communal dinner at a nearby restaurant. Today's trip is a bit of uphill to exit the city, then a long downhill ride through the desert to Jericho and the Jordan Valley. Early morning the bikes are checked and loaded very early. Then coffee and we’re off out of Jerusalem along the main road, making a brief pause at the Separation Wall at the Palestinian town of Anata on the edge of the city. Anata is essentially a Third World suburban enclave of Jerusalem where the residents have to pass a heavily fortified checkpoint to enter the city - and only if they have a permit. Anata is behind the 8-meter (24 feet) high concrete wall with a formidable checkpoint guarding access. We'll pause at the checkpoint to discuss the implications of Israel's actions in this area. Then we'll continue on Route 1, a four-lane highway leading from Jerusalem to Jericho. It’s mostly downhill, plunging 258 metres (846 ft) below sea level by the time we reach Jericho. 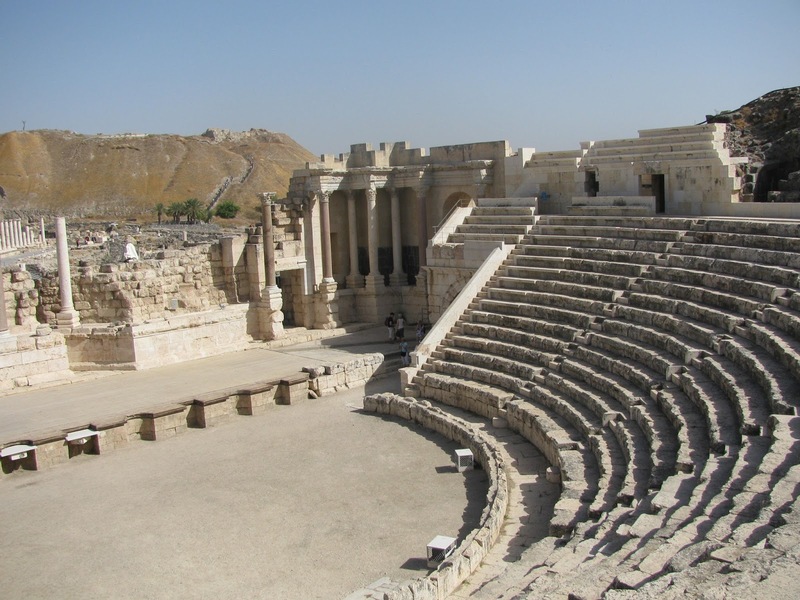 We'll peel off the main highway and head over to St. George's Monastery in Wadi Qelt. Founded in the 5th century CE, the facility hangs off the size of a cliff overlooking the wadi. We'll have breakfast overlooking this spectacular landmark. Then we'll take the back roads to Jericho stopping to take in the views of the Jordan Valley as we descend. 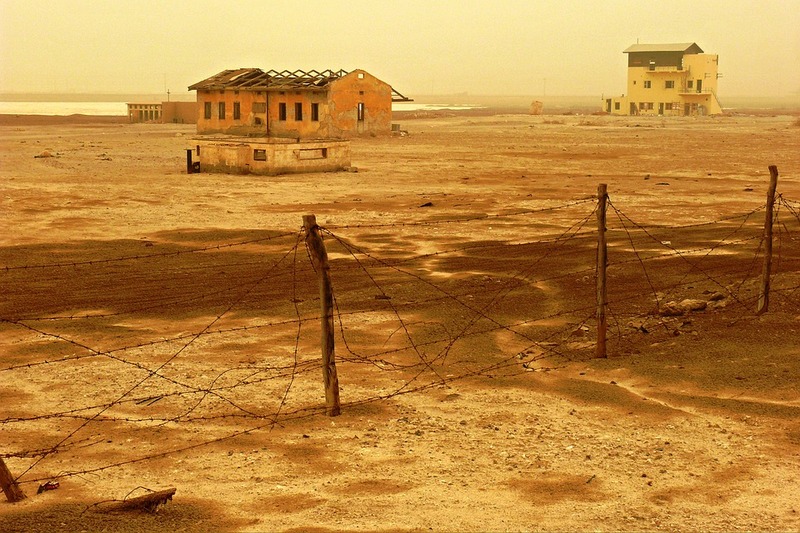 In Jericho we’ll visit a Palestinian Refugee Camp and ascend to the Mount of Temptation, . Jericho is a sleepy town, very flat and bicycle-friendly. We'll explore some of the back streets and visit with one or two locals. An easy day's ride with several detours. 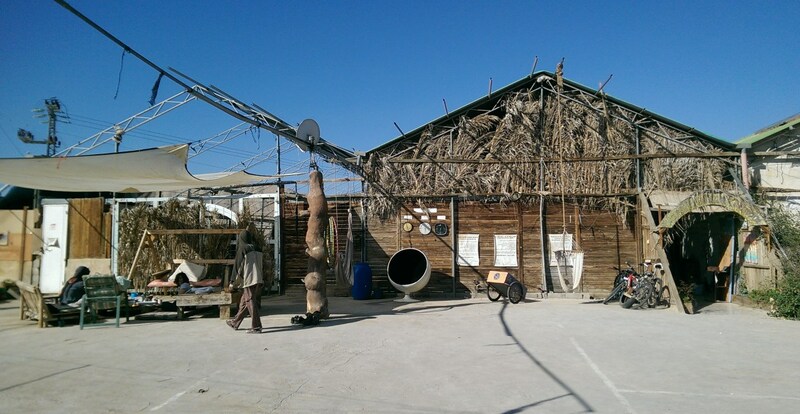 We'll take a look at Hisham’s Palace on the way out of Jericho, then north along route 90 to the Auja Environmental Center, located at the edge of a village of 4,500 Arab residents. Friends of the Earth run the facility which includes the guest house where the group will have dinner and spend the night. The visit includes a presentation about their work, and a tour of the grounds. A cycling visit to the nearby spring is a highlight of the day, and an opportunity to learn about the grave water issues in the region. Today's ride is a bit longer and includes a few challenging uphill stretches. The route takes us through some beautiful areas which have benefitted from the winter rains. Poppies and other flowers are in bloom, and a carpet of green is everywhere. Palestinian and Bedouin farmers in this region live in uneasy coexistence with the local Israeli settlers and the IDF. These relationships will be an ongoing theme of the tour. En route we'll visit an Israeli settlement to learn about their pioneering efforts and the expropriation of Palestinian lands. On arrival in Al Aqaba the group will settle in to the accommodations. Then a tour of the village for an overview of the situation there and visiting with locals. Today is a longer ride up the Jordan Valley through some of the most arid areas of the country, which then morphs into irrigated and developed rural and suburban Israeli communities. In the afternoon we’ll cross the border back into Israel and the final stretch will be a more developed area leading to Beit Shean. We’ll be up early for a quick visit to the Beit Shean National Park which includes the best preserved Roman theatre of ancient Samaria, as well as a hippodrome, a cardo and other trademarks of the Roman influence. Then off to the Jordanian border and over the Sheikh Hussein Bridge. It’s not possible to cycle across the border, so we have arranged for special transport for the bikes. Once through the formalities, we’ll take a short ride to the Sharhabil Bin Hassneh EcoPark. There's some good off-road biking in the area and you'll have some free time to explore on your own. Dinner and overnight with a local family in Orjan Village. The ride to day will be mostly downhill so we will arrive at Jerash for lunch. 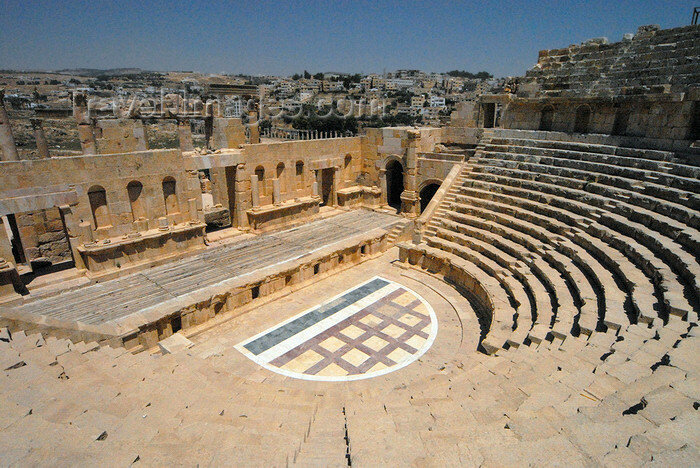 Jerash is another classic Roman site in a remarkable state of preservation. 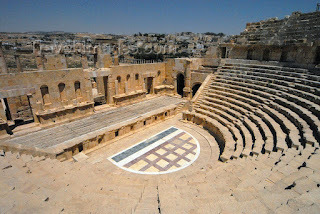 Jerash has been Inhabited since the Bronze Age and known for the ruins of the walled Greco-Roman settlement of Gerasa just outside the modern city. These include the 2nd-century Hadrian’s Arch, the Corinthian columns of the Temple of Artemis and the huge Forum’s oval colonnade. The Jerash Archaeological Museum displays artifacts excavated from the site. We will have a local guide to take us through these marvels. At the end of the afternoon we’ll transfer by van to to the village of Aljoun, through pine forests and olive groves. dinner and overnight in family homes in Aljoun. Today we’ll cruise mostly downhill back to the Jordan Valley and continue south to a campsite that will be set up for us at an exotic location. We’ll continue south to one of the lowest places on the planet — the Dead Sea. This will be an easy ride downhill to our destination which is about 400 meters below sea level. Then you'll enjoy some well-deserved relaxation at a luxurious resort with swimming pools, spa, and fine amenities. You'll have the afternoon and evening to enjoy the pampering and ambience. Today the group will leave the bikes at the hotel and travel for an hour by private motor transport to the ancient site of Petra. You’ll take a ride on horseback through the famous 'sik' a narrow gorge that is the only access. You’ll see the famous Treasury building and the Monastery, Petra's largest monument which dates from the 1st century BC. 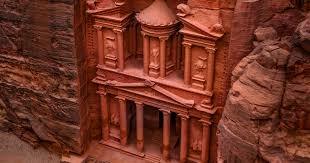 The origins of Petra date back over 3,500 years, with countless invaders occupying and expanding the site since then. We’ll bike to the King Hussein border crossing (Allenby Bridge) and transfer by van to the Palestine/Israel side of the bridge where a van will pick us up for transfer back to Jerusalem. You’ll be dropped off back at our starting point. Those of you who have opted for additional touring by van in Jordan, will be picked up from the Allenby Bridge. Those of you who have booked additional tours in Israel or Palestine will continue the following day from Jerusalem.